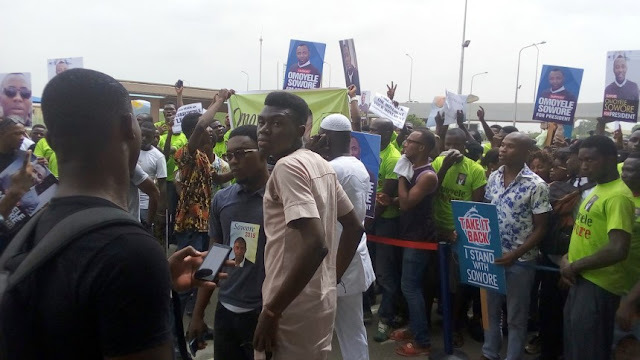 According to Sahara Reporters, things got odd at Ooni of Ife palace as Sowore and Take it back movement were tear-gassed following the refusal of the presidential aspirant to prostate to Ooni to protest the three hour delay in attending to the members of movements who had waited for his imperial majesty. According to SaharaReporters, One student and another member of the royal household collapsed due to respiratory challenges arising from the toxic fumes. Furthermore, the AAC aspirant , who confronted the Ooni on the assault on his person and members of his movement, wondered why a guest would be attacked within palace premises. In his own reaction, the Ooni of Ife, swiftly condemned the attack, saying such had never happened before in a palace in Nigeria and called for calm and restraint on both sides. He described the incident as embarrassing and assured Sowore of his continued support and collaboration.